Hopefully you’ll find what you are looking for by clicking on the sub-headings on the left. See the calendar page for the full calendar including all Sunday services, meetings etc. 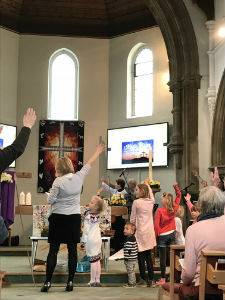 Should you have any further questions, you can contact us through the Church Office, which is open 9.00 am - 12.30 pm Tuesdays and Fridays and 9:00-12:00 on Wednesdays, by Telephone 020 8393 7273 (please leave a message if the Office is unattended) or click here to send an email. We are looking forward to seeing you at one of our many activities and events! Please note that the office will be closed during the Easter holidays. My last day in the office is Friday 5th April and I will be back on Tuesday 23rd April. Sue will be available throughout that time so please contact her at the vicarage. Don't forget to check our Special Events and our Easter page for more! Sunday 7th April – join us at 7pm as we watch the film ‘The Shack’. Thursday 18th April – Maundy Thursday meal at 6.30pm. 10am – Easter Communion and Celebration.